The Z540R offers unmatched quality, performance, and comfort, along with exceptional maneuverability and trimming capability. This mower is designed to efficiently tackle a wide variety of your mowing jobs. The Z540R is equipped with the Edge™ Cutting System high-capacity mower deck that can side discharge, mulch, or collect with a 6.5-bu Power Flow™ material collection system. It is powered by a smooth-running V-twin engine with long-life features for years of reliable service. The mower deck is stamped from heavy, 9-gauge, 0.150-in. steel for durability and has a deep-deck design to handle larger volumes of grass. 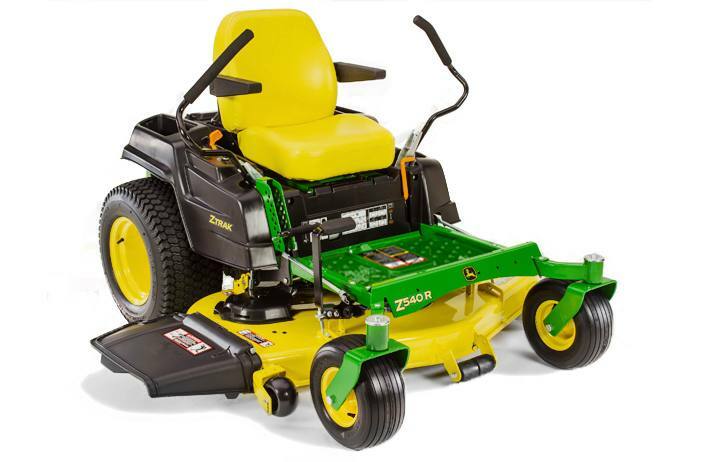 The Z540R's heavy-duty frame, large tires, and convenient controls provide reliability and an enjoyable mowing experience. *Per SAE J1940 as rated by engine manufacturer. The engine horsepower and torque information are provided by the engine manufacturer to be used for comparison purposes only. Actual operating horsepower and torque will be less. Refer to the engine manufacturer’s website for additional information. **Term limited to years or hours used, whichever comes first, and varies by model. See the LIMITED WARRANTY FOR NEW JOHN DEERE TURF AND UTILITY EQUIPMENT at JohnDeere.com/Warranty or www.JohnDeere.ca/TUWarranty for details.